Files that are stored in Enterprise can be easily moved or copied in Content Station, for example by dragging the file from one location to another. Example: Moving files by adding them to a Dossier or a Task is a common step in the process of gathering content for a story. Linking, moving or referring to a file? By actually moving the file. The file is moved to a new location. Example: A typical scenario is when a file is moved from one Dossier to another. By creating a copy of the file. The original file is left in its location and an exact copy of the file is created in the new location. Example: This method can be used when a file needs to be moved from one Dossier to another in order to edit it without changing the original file. By creating a reference to the file. The original file is left in its location and a reference to that file is made in the new location. Note: You can compare this to creating a shortcut to the original file. When opening the file in the new location you are actually opening the file in the original location. Example: Creating a copy by reference is what typically happens when adding a file to a Dossier or to a Task. To move a file, drag it from one location to another. Note: By 'location' we mean a Dossier or a Task. To copy a file, drag it while holding down the Alt key (Mac OS) or Ctrl key (Windows) or use the Copy To dialog box. Dropping: first drop the files onto the target area by releasing the mouse before releasing the modifier key. There are various ways of doing this. In short, you can drag a file from anywhere in Content Station where you can see the file as part of a Dossier and drop it anywhere in Content Station where you can see the Dossier or Task in which it should be added. An open Dossier with Dossier Content selected in the Info pane so that all files that are in the Dossier can be seen. Figure: When selecting 'Dossier Content' in the Info pane (A), the files that are part of the Dossier are shown in the Document pane (B). An expanded Dossier in a Document pane, for example in the Search tab. Figure: Click on the expander icon in front of a Dossier to see all its content. Note: The expander is only available when viewing the Document pane in List View mode. Figure: Areas in a Dossier on which a file can be dropped: a Publication Channel (A), a Task (B), the Document pane (C), or Dossier Content in the Info pane (D). Tip: When a Dossier is open but not in view, drag the file over the tab of the Dossier and hold it there for a brief moment to access the Dossier. An expanded Task in the Document pane — such as in a Dossier or in the Search tab — so that all files that are in the Task can be seen. A location anywhere in the Document pane within a Dossier. Figure: Dragging a file from a Task into the Dossier that the Task is part of. 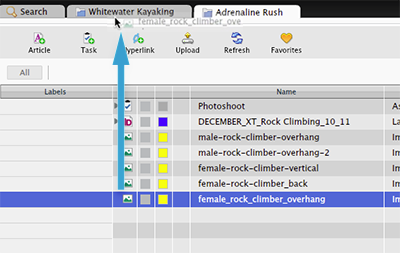 Figure: Dragging a file from an expanded Task to another Dossier in the Document pane of the Search tab. Use this method when you want to create a new file that is based on an existing file. A Dossier or Task anywhere in Content Station. Tip: This includes the same Dossier or Task that the file is already in. This will create a duplicate of the file within that Dossier or Task. The Copy To dialog box appears with 'Copy of' added as a prefix to the file name. Step 2. (Optional) Change the name and any of the properties of the file. Note: When copying multiple files, a separate Copy To dialog box appears for each file. When a file is uploaded to Enterprise, it only exists once in the system. When the file is subsequently added to a Dossier or to a Task, the file that you see in the Dossier or Task is technically a reference to the file in the sense that the original file has not moved. Another typical scenario is when a file in a Dossier also needs to be part of another Dossier. While moving it from one Dossier to another, a reference to the file can then be created so that it exists in both Dossiers (while technically it only exists once in the system). Drag a file from outside a Dossier or a Task and drop it into a Dossier or a Task. This is the regular method of adding a file to a Dossier or Task. 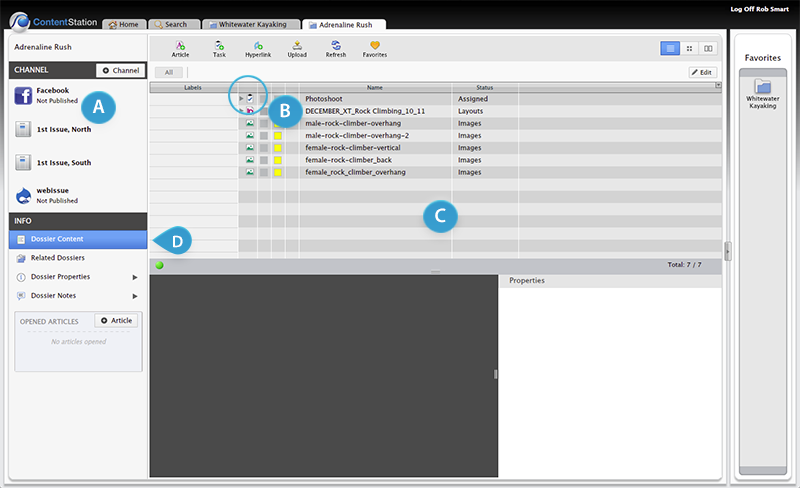 Example: Drag a file from the Inbox, Recent Items pane, Search tab and so on into a Dossier or a Task. This is the regular method of adding a file from one Dossier or Task to another Dossier or Task and have that file exist in both Dossiers or Tasks. 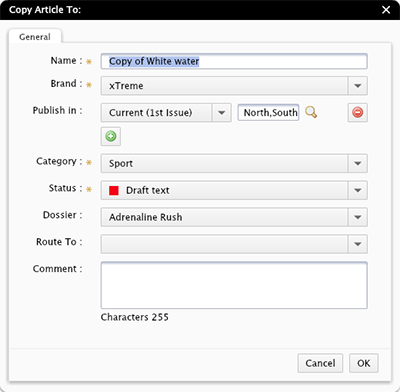 Expand a layout in a Dossier or Task and drag a placed article or image into the Dossier or Task itself. Drag a file from outside a Dossier or a Task and drop it into a Dossier or a Task while holding down the Ctrl key (Mac OS) or the Alt key (Windows). This method is not often used but does exist in case you want to make use of it.